Brown beetles are obscure little insects. As their scientific name, Bromius obscurus, suggests, they are quite small--5mm to be exact, but can be a big nuisance to gardeners and home owners. 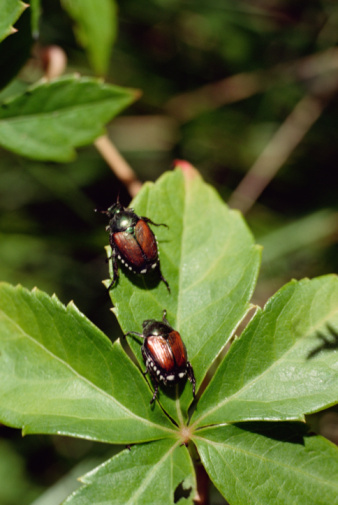 Beetles hunger for organic material like tree bark, plant leaves and flour. Their voracious appetite can lead them to destroy plants and pantries across America and the Atlantic. Get them off your property and out of your life with these simple steps. Brown beetles can destroy plants and pantries. Remove loose tree bark located near your garden. Understand that beetles often make their homes in loose tree bark, which they use as a base for foraging into your garden for leafy food. Pull off the loose bark, or move your garden away from the tree, and you'll likely remove the beetle infestation from your garden, sending them in search of greener, or browner, pastures elsewhere. Fill a spray bottle with a mixture of castile soap and warm water. Spray the liquid, which is non-toxic to plants and yet functions as an insecticide, onto your garden. Spray a generous amount of the mixture around the doorways and foundation of your home if you are noticing brown beetles inside your house. Open your pantry and locate your flour if you are noticing brown beetles in your home, as your kitchen is likely the source of the beetle infestation. Remove the flour from the pantry and examine bags for holes, which indicate beetle entry. Upon locating beetles, remove all the contents of your pantry and cleanse it thoroughly with a mixture of lemon juice and vinegar. Restock and store un-infested dry food items in airtight plastic bags and containers. Nicole Schmoll is a freelance writer in Omaha, Neb., who has been writing professionally since 2005. Specializing in gardening, religion, communication and marketing, she has been published in "Woodmen Living," the "Journal of Current Issues in Research and Advertising" and various online publications. Schmoll holds a Master of Arts in communication.